(1898; Lost Classics Book Company, 1996), pb., 306 pp. 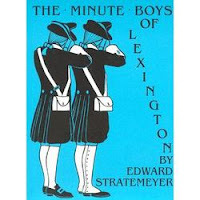 This is a fictional account of the battles of Lexington and Concord. The main character is a fictional 16 year old boy who has organized a group of friends as “minute boys” to work alongside the minute men. The story covers just over two days and is jam packed with adventure, danger and bravery. My boys loved it! The 19th century language has been slightly edited but it can still be a challenge in places. I think it is important- in order to be able to read such books to your children- to be able to update language or substitute words as you go. The book contains a 14 page glossary that is also helpful and is a way to build vocabulary. This can present a bit of a challenge in reading, but it is slight and worth it. The dialogue of two characters is also written in dialect which can be a challenge, but we find it fun. This is a fun way to get a feel for the beginning of the Revolutionary War. This book is also an example of those books from the past which are intentional in encouraging character, nobility, etc. We enjoyed it and commend it to you.